An existing client of mine, Impact United Soccer Club, wanted to update their site. I showed them the benefits of using WordPress to allow them to manage their site content on their own. WordPress has been know as a blogging software. Even though this is true, the software as moved more and more toward a content management system. This allows it to fit into almost any site. 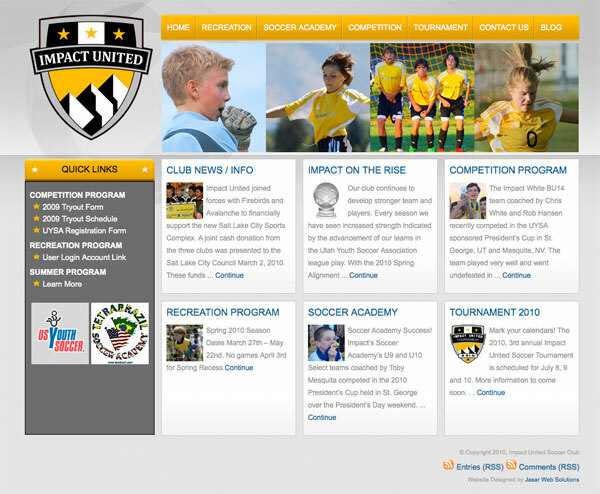 The objective on this redesign for Impact United, was to make it more interactive and easier for the visitor to obtain the information they are looking for fast. They could not find an existing theme which fit all their desires, so I created one from scratch. I used Jquery for the fading images on the top and utilized the widget areas in WordPress for the six boxes on the home page. Check it out and let me know what you think.